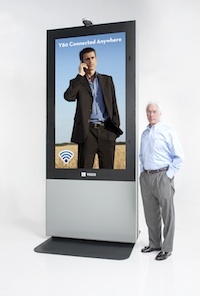 YESCO Interactive Outdoor LCD is a division of YESCO, which has been a family run business since 1920. We are best known for our reliable products, dazzling image quality, best-in-industry energy efficiency, and ease of installation. We assemble our outdoor LCD displays in the USA. YESCO Outdoor Interactive LCD began designing and manufacturing our own ruggedized outdoor LCD systems in 2009, when we could not find acceptable products or sufficient service in the marketplace. Located in Las Vegas, Nevada, our first customers were from the gaming industry. The displays had to survive in the most demanding conditions – 24/7 use in the punishing Las Vegas heat. Today we have deployed our interactive outdoor LCD display signs around the world from the Las Vegas Strip to New Zealand, to bus stops in Puerto Rico, and to the streets of London. Blue are permanent installations, Yellow are temporary rentals.